Twitter Resonance Rules Brand Evolution — The Prequel. It seems that during the rise of Social Media marketers have been confounded by the Twitter software platform and have struggled to understand its impact on the companies that they serve or their profession. The temporary nature of Twitter communications is contradictory to one of the prime directives of marketing, defining and increasing brand value. When I visited Silicon Valley in San Francisco in 1992 I saw the first Yahoo! billboards that promoted the notion of the internet and the Yahoo! directories and in 1998 or 1999 I noticed the beginning of Googles search engine results pages driven by content backlinks in a form of a popularity contest. Five or six years later the idea of search engine optimization is born when competition starts to erupt over link names and search engine page results or SEPR ranking. Marketers were watching Google carefully and noticed that it was much more cost effective to adevertise on the internet and you could advertise to individuals unlike mass media of the day. Marketing was moving slowly into the world wide wieb and soon the crawl would be a walk and then a race to see who could stake the best words in a form of ‘virtual land grab’ so that when searchers entered a phrase into a search window the products promoted by savvy marketers would rise above their slower and less internet knowledgable competitors. Branding also evolved quickly in the late 1990’s and early 2000’s mostly due to the rise and fall of world economies and old school advertising agencies we pressured heavily by Public Relations firms that repeatedly SHOUTED their messages. It appeared that quanitiy and repetition had triumphed over quality, at least in most cases. The repetition of brand messages fit well into the theory of branding where it was assumed that products would be purchased in perpetuity and that brand managers would strive to maximize profits and determine how to position brands so that competitors could not take customers and sales from the brand. Economies of scale in manufacturing and advertising were critical drivers of brand equity where eventually competitors would start to outsource in continually lower cost global locations while seeking any advantage in their brand warfare. Eventually the global outsourcing trend moved from a crawl to a brisk walk and then a frenzied dash to Canada then to Mexico, China, India, Brazil and the Phillipines. Software suppliers like ASK, CA, BaaN, IMI, SAP, Oracle and IBM provided big corporations big systems to control global supply chains and achieve the dream of global economies of scale. The stretched supply chaines required supplier agreement timelines of up to two years which became a problem and eventually bankrupt corporations like Nortel who were competiting with Asian competitors of handsets and telephone infrastructer with product cycles of six months or less. The Nortel products and inventory, on-hand and future committments was obsolete before it could be manufactured The large ERP systems compounded the problem as planning cycles were optimized and precise, thoug it was doubtful if the users were capable of assessing the risk or trained to deal with it nor were the suppliers capable of adjusting quickly to the new world order. Time was speeding up and the corporations with few long term obligations and even fewer long term investments would reap the rewards. Marketing and Branding followed the trend of cost reduction and increasing speed and internet services and product vendors like Cisco, Oracle and SAP were happy to comply with the direction and push hard when they realized giants like IBM were afraid of leaving profitable territory. One significant consequence in the speeding up of time in business is that products have become commodities and in markets like fashion it may be as little as two or three days after a model walks down the runway in Milan that a knock off or copy of very good quality clothing is being loaded into a container in Asia bound for European and American retailers. Branding is the only distinquishing feature in the commodity game and marketing the main value driver. From early 2000 to about 2005 marketers had an easy time cutting advertising costs by shifting to PR and internet advertising, mostly around email and simple websites and while a lot was said about electronic commerce not too much was happening, yet. 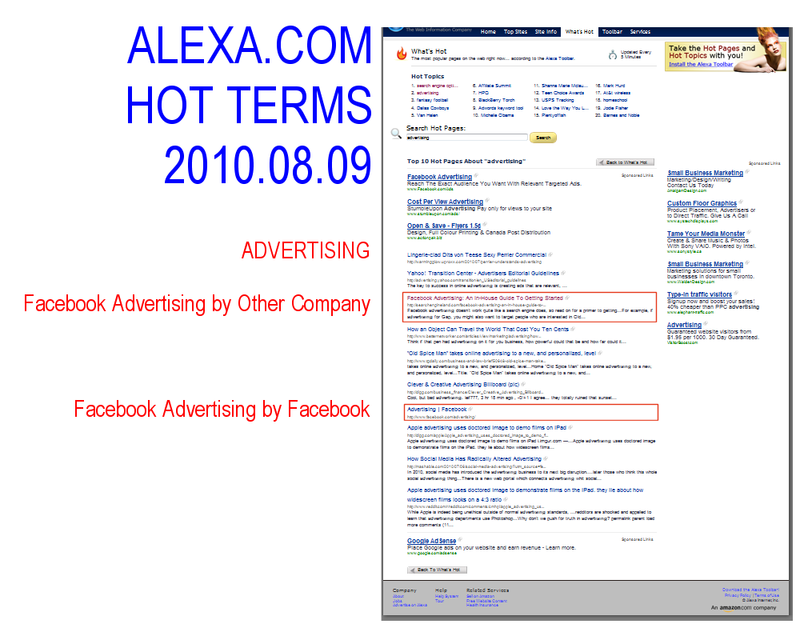 As cost competition rose so did competition for favourable internet branding position and this cause the creation of a new profession, search engine marketers which could exploit the tendency of people to type a few words into a search engine box and be ‘served’ the answers to their questions. Google made billions by being a servant. It didn’t take entrepreneurs too long to figure out how to exploit search engines and learn to stand between product manufacturers and millions of buyers who wanted to buy their products on-line saving 50% or more in the process. Soon every brand would be pushed down in the search engine results pages or SERP. The process accelerated faster with the creation of the Social Media software platforms WordPress, LinkedIn, Facebook and Twitter and soon SEO entrepreneurs could create content and backlinks to easily manipulate the SERP and amateurs realized what was possible and they climbed aboard the gravy train. In an attempt to counteract the trend Google buys Metaweb the semantic database firm, starts its own blog platform and starts archieving Twitter feeds while pushing the SEO entrepreneurs to create video content and feed its YouTube pipe which it aims squarely at the old Media conglomerates. In the meanwhile Blockbuster Video enters bankruptcy protection in mid 2010 and Twitter reaches over 150 million users, most of them mobile and in countries like Brasil and India. Sylvester Stallone shows the world the new Twitter marketing resonance rules as his move Expendables first catches and then screams by Leonardo DiCaprio’s Inception. Stallone is fueled by a clever tsunami like Twitter campaign fueled by millions of Brasillian Tweets. The quick rise of Social Media and Twitter makes it harder to convince advertisers that search engines would or even could continue to deliver the brand value and in late 2008 or early 2009 over half of searches started in Social Media software platforms. Corporations quickly start jumping into the Social Media and Twitter pool with both feet distressing all of their suppliers who must quickly re-face products that were designed in the late 1990’s to now work in a world where business models and time had accelerated beyond recognition. With only 140 characters the Twitter software platform is able to deliver stunning value by combining content and backlinks so that if a Tweet or micro blog post is not popular it expires. No need to assess or rank, no need to archieve. All of the work is outsourced to the Twitter community. Better still no need to worry about old content, good bad or indifferent, and certainly no need to build server farms worldwide. Instead of charging fees based on ‘clicks’ and forcing customers to spend money and time on SEO that is totally disconnected with sales, Twitter charges advertisers according to how long a Tweet is heard and how far it goes across groups in the Twitterverse. Unless a Tweet is ‘Re-Tweeted’ it expires though advertisers can promote their own Tweets which means that Twitter will place a very few of them in their Trending dashboard making them visible to millions of Tweeters globally. Marketers get multiple branding messages for free which is a pleasant change from SEO models where a ‘conversion’ or sales ratio of 5% is considered wildy successful, if you don’t count that you have to pay for the other 95% of ‘clicks’. Branding has moved to virtual real time speed with Twitter though marketers haven’t had the opportunity to explore or determine best measures Resonance or the relationship between Customers, Products and Content. Shun SEO for Sustainable Profits! Twitter’s move to a Resonance based advertising model is the main driver behind moving the SpeedSynch web and social media sites away from an old SEO keyword design to a sustainabile Resonance micro site design built with Semantic meaning. Sustainability is the key. Like any other business we don’t do anything unless it is linked to serving our customers or improving our competitive position in the market and Resonance allows us to avoid unsustainable SEO models and offer unique Social Media value to our customers. We review SEO and sustainability at detail here though in summary the ability of almost anyone who generates enough content to confuse search engine spiders and become more visibile that the manufacturer of a product means that buyers pay more for a product and the market efficiency promised by the internet is patently false. Once you consider that currently SEO adds to your cost of buying almost anything and the cost of selling almost everything on the inernet it becomes obvious that there must be a better way and Twitter has apparently found it with Resonance. Resonance is created by content, whether it is in the form of a blog post, Tweet or product content used by searchers to help them find what they need or learn something they value. Searchers interact with content and SpeedSynch measures content and behaviours to create Resonance maps based on Semantic meaning rather than SEO keywords used in PPC advertising and marketing. Content must ‘resonate’ or engage searchers to deliver real value to people and if the content doesn’t help them accomplish their objectives then resonance fades very quickly. The search-engine-optimization or SEO advertising models don’t concern themselves with user value and they charge customers according to how may people ‘touch’ or click on the content regardless of its value to people. Twitter understand the SEO model is not sustainable and spent a consideable time exploring options before moving to Resonance. Google or BING “any words used in similar spaces share meaning” and you will find practical resources for semantic meaning which we use in assessing Resonance. From a searchers perspective any content that helps refine a question or refine an answer resonates with the searcher. The content is relevent or has high quality and value. From a buyer’s perspective the products that fit the objectives or needs of the buyer resonate closely with their current assessment of value. It is important to note that a searcher’s or buyer’s assessment of value changes quickly for different reasons and we accomodate this simple truth with the persona concept. Understanding closeness of meaning or affinity of purpose gives you a good idea of whether two things resonate. Content, whether it is text, images, audio or video, is often confused with the value it delivers which is in turn determined by its format, location and it’s facility of interaction with products and people. Content can be used to describe products or it may be used as a wayfinding tool to help people find other content or products. Content that is crafted and delivered well allows people to define questions that they are not sure about and perhaps refine their understanding as they learn during their search. Content also helps people understand what is needed to achieve a goal, how or what to do or where something that will be pruchased, returned or repaired. Often people refine questions or answers at the same time as they look for and find content during a search and once they know their answer, they will go out an find a product. Content helps describe questions, answers and assists people to self-prescribe the products they need. SEO marketing is a fairly simple concept. Web sites and blogs are the spaces that hold content so that it may be explored by people that search for answers or products. It is still believed that people search by entering word combinations or keyword phrases into a search engine in order to find the content that will lead to the products or services that they will eventually buy. SEO marketers devote considerable resources to balance their desire for high volumes of potential buyers with relevency which attracts the right type of people they wish to serve. Getting many people to a product is useless if they don’t buy because it is irrelevant to searchers. Content is tasked with ensuring that search engine spiders rank their web or social media sites highly, ideally on the first search engine results page or SERP. Being number one is the ultimate goal and closer to the top of the first SERP means more profit. However after 18 years marketers have devised their own ways to entice search engine spiders to their sites. Indeed in early 2009 more people start searches in social media sites like Twitter, LinkedIN, WordPress and Facebook than entering keyword phrases into Google. There is a simple reason for this and content is the answer. Blogs generate far more content that corporations and I review the main reasons in my Semantic Blog in WordPress. In an interesting twist the desire for corporations to set up and forget websites has allow bloggers to divert the search engine spiders so that blogging content impacts the visibility of all brands and products worldwide. While this is obvious it was Adobe, considered a slow moving dinosaur by both Google and Microsoft, that acquired Day Software to provide corporations with content generations factories to fight the content war currently being won by the social media platforms. Google did some acquisitions of its own acquiring Metaweb and accelerating the move away from SEO keyword phrases to semantic themes. While the old guard SEO marketers and promotors will argue how many years this will take it is very easy to see how many SEO experts where brutalized when Google’s algorith changes in May and June 2010. If you listen carefully you will hear how SEO marketers adjusted by creating more links and backlinks and adjusting the infrastructure of their SEO sites but the writing is on the wall. Backlinks are created when someone like the content they find on a site and notes or sites the site in a blog post or on a web site–people link back to the content that is valuable to them. We believe that Google is currently applying semantic algorithms to content and working quickly on backlinks which are the lifeblood of SEO marketers. By measuring how the sites that carry the links to the content being evaluated by search enging spiders Google, BING and other search engines will know the value of the backlinks according to semantic relevencyof the searcher. A link originating from a coffer grower will have more relevancy as a backlink to content about coffee on a site that discusses or sells coffee than the same link on a site focused on baby clothes where mothers blog about needing coffee while shopping because they are sleep deprived. Google currently does this with keyword phrases and the use of semantics will take it to a much higher level where it is possible to attribute different semantic meaning to the same content and also the relevency of backlinks. We will show how this is possible with SpeedSynch and how SpeedSynch may be applied to understand current and future customer perspectives and behaviours which we call Neuropersona. The simplest measure that shows how quickly things change in internet marketing is that from month to month searchers use only 50% or half of the same keyword phrases to describe the same objective or problem. This change is consistant and causes marketers to constantly change how they describe products, services and the content used to help searchers find the products they need. Quite simply searcher perspectives change so quickly that the relevence of content and backlink naturally errodes and must be updated or switched in accordand to new searcher perspectives. Old backlinks should not have the same weight or value for search engine spiders or people. This becomes a huge problem for old school SEO marketers who thrive on just backlinks or believe that the more backlinks the better. Not only does customer behaviour change with search but it is also possible for searchers to change their behaviours in another way that causes marketers even more stress. Consider the case where someone in the same househld buys items for other members in a household three times in one day. Is the buyer a man, a woman or a child? Did the buyer buy because they had to replace the item and will contine the buying pattern? Did they buy a gift? Did they buy to replace an item borrowed from a neighbour? So now we have a little background on SpeedSynch, SEO, Semantics, Neuropersona and now it is time to move on to the first episode where we move from a focused single page site that is part of a larger microsite on www.adscenario.com to a five page blog based micro site on a WordPress platform with a tight Twitter connection for alerts. In order for us to achieve our goal of creating an internet asset to attract both search engine spiders and people that become satisfied customers we start by creating SEO reports of our Twitter feed because it is there where we reached out to customers first with the stories that we found relevent according to feedback. Twitter is a critical element in communication today because of it’s realtime and because most tweets or posts in a Twitter feed link to or act as backlinks to web sites or other social media sites. This is the case with SpeedSynch where the Twitter semantic SEO report above is a map of 10 tweets. It is the last 10 tweets and the associated blog posts that indicate where our customers are taking us and where we intent to go. Our next post will highlights Google’s fast push away from SEO keywords to semantic meaning. Do you get better SEO ranking and customer awareness when you distribute content across social media sites by hand versus an automatic tool? Is this different than email spam? If you can automatically generate and content to complements people or blog perspective where you will post then it is not spam. If you post virtually the same content in response to different people or blog perspectives then many might considere it spam. ‘By hand’ infers personal touch and content perspectives aligned to the meaning of the person or blog where you intend to post. Why not use an automated process that includes the judgement of a person who might also adjust each post ‘by hand’ if needed? Search to find where to post your content by following links in Tweets. Twitter Rules SEO value. Use SEO Reports if possible to examine the ‘meaning’ of the content where you want to post. Read the content and adjust your post to complement or support or provide another perspective to the content you have discovered via a Twitter search? Tweets provied multiple perspectives of the keywords in your content. Find the Tweet that is closest to your content perspective and toadjust much less ‘by hand’ content which means you go faster. Here Twitter and SpeedSynch provide immediate perspectives and meaning that ‘cut and paste’ posting systmes lack. Twitter and eyeballs would do the same with a little practice. Google will penalize the client for which you are building them unless you adjust the posts, ‘by hand’ or not, they will probably be rejected or labelled spam and most probably be considered ‘similar’ by Google which means the backlinks that you are attempting to create will be worse than useless. Twitter is more than a broadcast platform and we use Twitter to create a unique form of competitive analysis that guides how we create content for blogs, links and backlinks. The SpeedSynch Twitter semantic map below keeps the content we build and post to Social Media sites synchronized with our internet marketing assets that include domain names, links, backlinks and blog content. We can quickly recombine blog content for Flickr.com, StumbleUpon or other Social Media sites and we always synchronize product stories, customer needs and internet marketing assets to avoid wasting time and money or risk of alienating customers. The semantic SpeedSynch Twitter feed map below helps us orient content and leverage our Internet Marketing assets. SEO professionals will note that the semantic signature of the blog content is consistant and complementary to the semantic signature of the SpeedSynch Twitter feed above it. Twitter’s future appears bright indeed because of 140 character stories broadcast worldwide on mobile phones though in sharp contrast the future of Facebook is very uncertain. Facebook appears to have a difficult time competing with it’s own community members in web advertising as it promotes a new business model in an attempt to stake a claim as an effective advertising platform. Let’s start with Twitter’s amazing value and unique ability to align content to people and stories internationally across social media and web sites in multiple languages. The immediacy of Twitter is insurmountable and highlighted in a short WordPress post that uncovers millions of Brazilian posts about Sylvester Stallone’s new move, Expendibles. The huge wave of tweets in response to Stallone’s Expendibles is social media advertising on an unprecendented scale and creates significantly more value than the popular alternative of purchasing a few Google adwords or maybe all of Facebook’s current advertising. The Brazilian tweets shouted loudly across the world and while here they seem ‘negative’ the publicity they generated helps Stallone fight to position Expendibles in a highly competitive market currently dominated by DiCaprio’s INCEPTION and Angela Jolie’s SALT. No easy task though it seems that the tidal wave of Brazilian tweets predict a bright future. 140 characters in your Twitter feeds can tell me what , when and maybe even why you or your company will do. If this sounds unrealistic have a look at this is a Semantic SEO report of our Twitter feed which we use to deliver content to educate our current and future customers. Social media sites by their nature must change quickly to accomodate and serve their customers. Web sites on the other had change very slowly in comparison. They are tightly controlled effective, efficient and usually have a higher quality standard than social media sites, which is why since early 2009 content creation, searches and business models have moved towards social media. Internet marketing is not possible without competitive analysis as customers have too many options available. They find content virtually anywhere and can buy from just as many suppliers. Indeed if you Google any product or service the manufacturer or licensed reseller is often not on the first SERP or search engine results page. Competitive analysis is the art of finding where you are compared to your competitors on Google and measuring the distance of your story from your current or future customers on LinkedIN, Twitter or WordPress. SpeedSynch Semantic SEO report maps like the one below lets you easily compare the semantic signature of products, content and customers to determine if your story is close to your customer needs and when the distance changes. 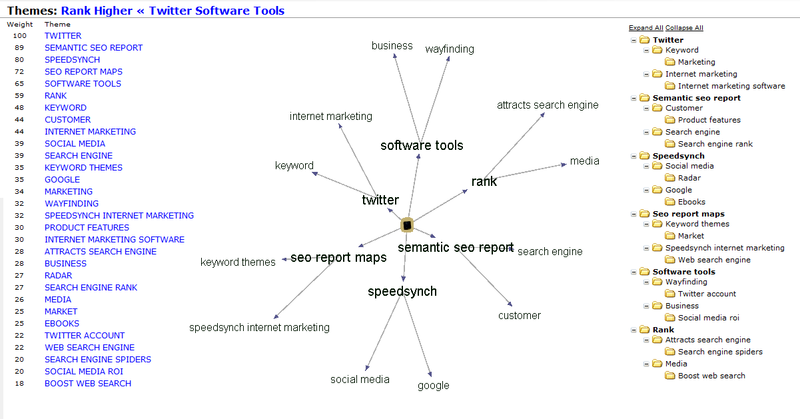 Note different themes on the Twitter feed of SpeedSynch.com and the Semantic SEO report map of SpeedSynch.com below. We clearly see the SpeedSynch Twitter shift by looking at the semantic differences to the web site Semantic SEO report map above. I must admit some of my partners were uncomfortable with me exposing our Semantic SEO report map and in defence I will say that there is one highly critical piece that is missing, our customer behaviour maps which clearly illustrate the changing needs of our customers though we describe how they are built on www.neuropersona.com and I will blog about how it’s done very soon. Now we move from the unique competitive analysis value created by Twitter to Facebook’s upcoming advertising failure. Facebook is about to follow in Google’s footsteps as it attempts to profit by implementing an advertising model which appears to focus on offering advertisers access to Facebook community members. Facebook may be in for a very big surprise as they start to compete with their own community members for advertising revenue. Content is the key for advertising visibility, reach and relevence and Facebook community members have many years of experience in competing with Google. Let’s see how Facebook does, though my feeling is that it will not be as good as they plan. Link Thieves are choking your brand value. Your brand value is being throttled back by bloggers who build content with variations of your brand content and here is how to identify it so that you can take immediate action. When you find the sites that have been positioned above your brand or product you will probably find link thieves and here is what they look like for SpeedSynch. We create unique semantic SEO report maps with our SpeedSynch internet marketing software that allows us to drop link thieves as the search engines shift quickly to semantic algorithms. In this case it is highly unlikely that anyone searching for SEO reports or semantic consulting services or internet marketing software with semantics will also search for a camera. Indeed the old school SEO myth that this type of link ‘stealing’ is useful no longer applies and the link thieves permitted me a simple way to illustrate what few people realize–their brand and product value has been choked back by link thieves and Semantic SEO is the way to go. Google and BING both think so too. 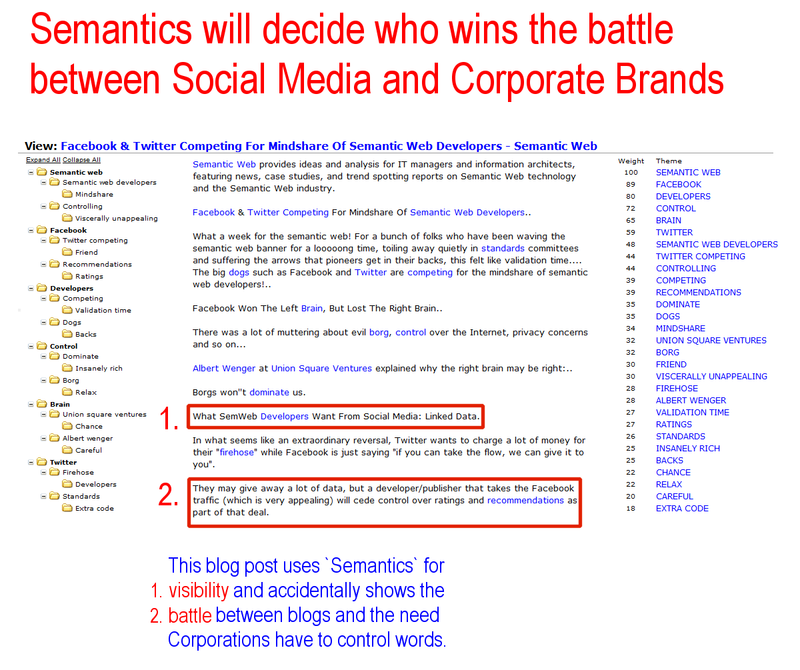 Social Media vs Corporate brands and why Semantics decides who wins. By almost any measure in early 2009 Social Media platforms were where most people start searching for things which caused a considerable amount of distress to corporations and the search engines that served them. People had learned that if they posted enough content, almost regardless of quality, then the search engine spiders would be distracted from the focused corporate sites and rank quantity first, and this is what happened. Let’s explore how we might be able to exploit this trend. Sometimes its easier to make a point by showing rather than telling so lets have a look at any brand or product that you can think of and see who’s content the search engines believe is the best for you. Type any product or brand word into Google, BING, Yahoo or another search engine window and you will probably see somewhere in the top 5 links though not necessarily in this order; Wikipedia, Amazon and three links totally unreleated to the product or brand. These are bloggers, usually entrepreneurs who make considerable money when you click on their links because they provide you value whether it is information from content or the ability to buy something faster than manufacturers or their partners that deliver the products to market in older business models. Your brand value is being erroded by link thieves today. 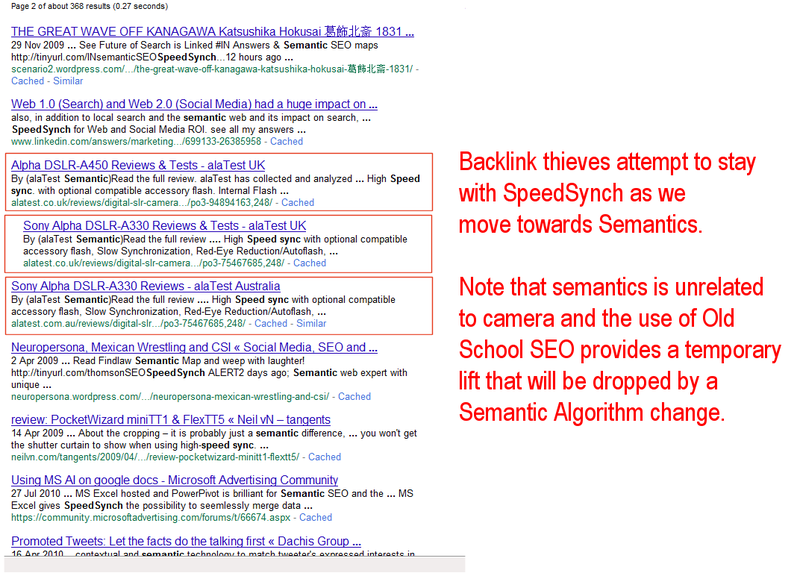 Se how link thieves affect my SpeedSynch brand and search on your brand to see how your brand value is being erroded by link thieves. Blogs and bloggers discovered that search engine spiders depend heavily on backlinks or links from blog posts connected to content that they need to evaluate in order to compare and rank content from different web sites, social media or corporate. Once the ranking is done it is offered to searchers according to word combinations that they enter into search windows. Bloggers started creating links and backlinks by the billions and corporations by the tens and hundreds. Its no wonder that corporation rank quite low even when they search for their own products and brands. What did they do? Corporations did what the bloggers did, they copied the best and essentially use blogger tactics in Social Media sites, not creative but effective. This however causes considerable stress for advertisers in old media and no the search engines as they didn’t have visibility in social media and the owners of the popular social media software platforms made millions and soon billions. Now the pendulum swings back as the content generated in the social media platforms chokes their ability to provide useful content to their own users and the bloggers actually need the search engines to create value for the content they generate. If one fails they both fail and now the search engines are tinkering with their algorithms so that they control results but don’t kill the blogs and for this they intend to use semantics. Wikipedia defines Semantics though everyone else, like in th commentary above, defines it their own way for their own profit. Here is a semantic seo report map created by SpeedSynch to illustrate how bloggers use content for visibility. 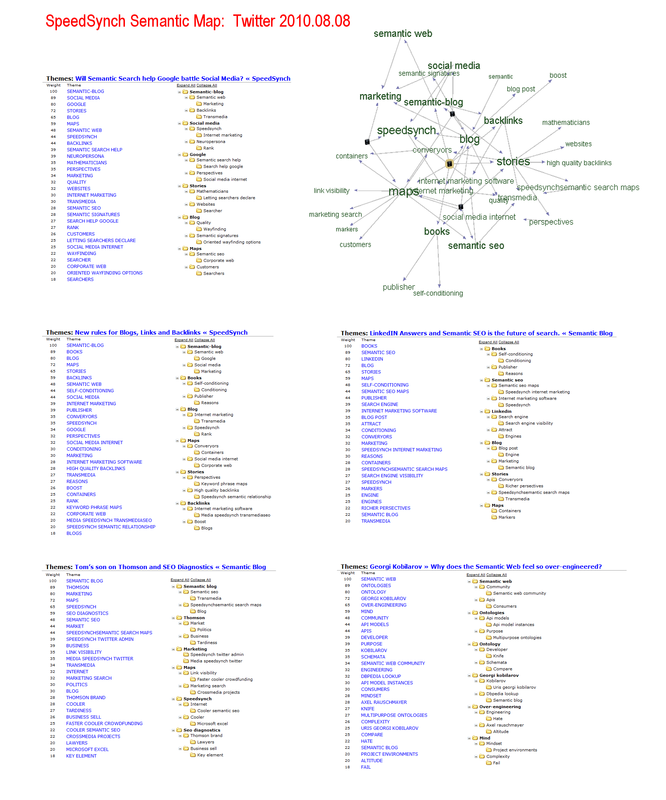 SEO professionals will note the keyword stuffing totally unrelated to semantics and by accident this map illustrates the battle between blogs and corporations. Semantic meaning is important as all three players in the battle for words must deliver value to searchers or visitors to blogs, corporate sites and search engines. They have a common benefit and semantics will deliver a common value if it is done from the perspective of searchers or visitors. Look at the semantic SEO reports map created by our SpeedSynch internet marketing software above and you will notice how different people with unique perspectives can find value by looking at the graph and keyword themes. The last sentence above is a mouthful but my SEO consultants told be to optimize on “internet marketing software” and “SEO reports”. So I ensure the terms are in post, on the image tags and categories and I start blogs with names like “iinternet marketing software”–note that on WordPress “internet marketing software” was already taken so I added another “i” as the search engines disregard it giving me the visibility I need. This is old school SEO which is quickly losing value and being replaced by Semantic SEO. Semantic SEO is creating content, like this post, that the spiders can read and determine that it matches the semantic meaning which is probably useful to a searcher based on how other searchers have defined semantic meaning for words entered into a search engine window. Now the old school SEO folks will say, “no change”, but there is a change and it is subtle and the subtly is why there is so much pain if the webmaster forums that are attempting to ‘decode’ Google’s “Caffeine” algorith. Subtly often requires time to study and careful consideration before arriving at realization, learning and insight and Semantics will be a process rather than a formula. My future posts will show how SpeedSynch.com moves from the old schoold SEO design to Semantic SEO almost like a reality show and why I believe Japan should win the Semantics SEO battle. Apparently search engines forcus on titles and text that is either bold or italics– we will see! If you want your blogs, links and backlinks to boost your search engine rank you must learn about the new rules of semantic search. Lee I read this as “what kind of books do you read?”, either way it’s the best question I’ve seen in LinkedIN, brilliant! 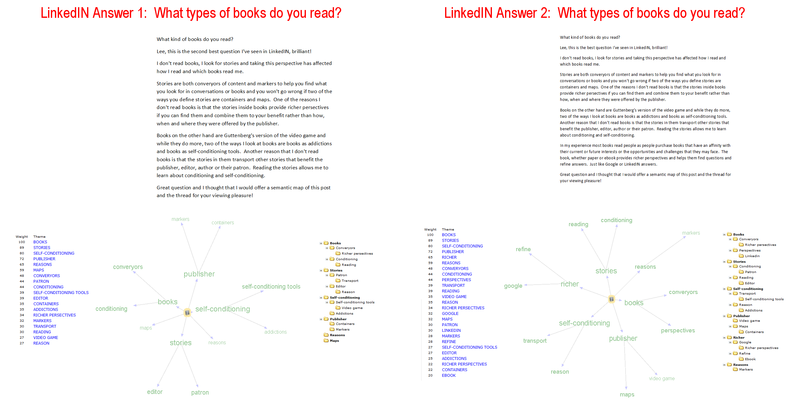 Stories are both converyors of content and markers to help you find what you look for in conversations or books and you won’t go wrong if two of the ways you define stories are containers and maps. One of the reasons I don’t read books is that the stories inside books provide richer persectives if you can find them and combine them to your benefit rather than how, when and where they were offered by the publisher. Books on the other hand are Guttenberg’s version of the video game and while they do more, two of the ways I look at books are books as addictions and books as self-conditioning tools. Another reason that I don’t read books is that the stories in them transport other stories that benefit the publisher, editor, author or their patron. Reading the stories allows me to learn about conditioning and self-conditioning.